Processes that arise in the course of heating of liquid hydrocarbon mixtures in the channels of heat exchangers containing process intensifiers are considered. Random metal packings and coiled elements are used as the intensifiers. Using a cellular model of the flow structure, an expression is derived for calculating the temperature profile of the heated medium along the length of the channel. Formulas for calculating the Nusselt number in a channel containing intensifiers as well as the modified Péclet number of the flow structure are presented. 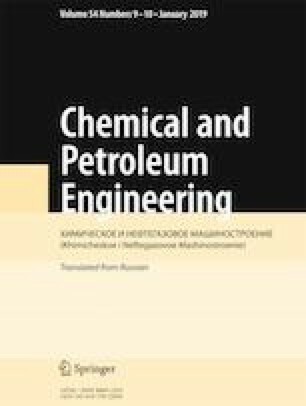 Sample calculations of the process of heating of turbine oils and marine diesel oil are provided. A significant increase in the efficiency of heat transfer (more than eight-fold) and the force factor (more than fivefold) is demonstrated. Translated from Khimicheskoe i Neftegazovoe Mashinostroenie, Vol. 54, No. 9, pp. 11−15, September, 2018.